Under a minute and a half easy. Best time at 53 sec. On a previous phone 1 managed even less. Have to admit that i have played the game (and submitted) well over 450 times. By changing the game to 'digit first' I improved my times by approximately 30%. I still can't figure out how you can input those numbers in the time quoted though. Nan-jeong wrote: ...and here I thought my 2:11 on easy was smokin' (for me, at least) until I signed up today to check out other ppl's times. How do they really get it under50 seconds??? Best Easy was 1:29, on March 11, this year (2017). I had been only doing Extremes, but now, usually do one in each of the four categories, just to get warmed up. 1:32 for me. Extreme has given me strategies for easy. I think I'll be able to get to 1:00, maybe a bit less than that. 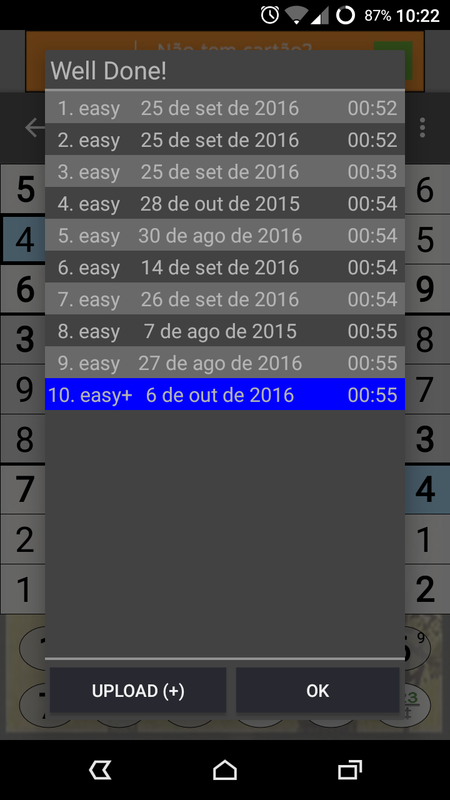 My best time on easy was about 6 months ago. 53 seconds. On the tablet, not the phone. The bigger screen makes a difference. I saw a YouTube video of a girl who solved in about 30 seconds. She used both hands to enter answers. I can't do that, but I believe it's possible. My average is probably about 2 minutes, maybe a little more. When I'm in the zone, I get times around 70 seconds. That's a lot better than I used to be. 1:00 in April 14 this year. I solve at least 10 puzzles per day, many under 2:00, but the time may go up to almost 20:00; i.e., the algorithm to create a new one seams to be rather weird: Easy is sometimes Extreme. Why is this? The times submitted here in statistics (many far below 1:00) seem to cheat somehow. 39 seconds. It was just there. Next fastes time 53 seconds. Over the period, only Hard is one where always end up above 3 minutes..